Over time, grit and dirt will become embedded so deeply in your carpet that it will require a professional cleaning. Proper cleaning will remove this dirt as well as brighten the rug's overall appearance. Depending on the amount of traffic, we recommend that a rug be cleaned at least every three to five years. The only way to clean your Oriental rug is to have it hand washed. 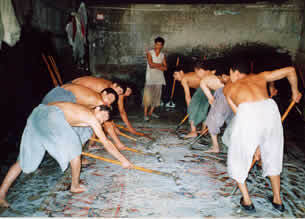 The Magic Carpet has washed thousands of rugs using traditional methods. The rug is saturated with water and a pH balanced shampoo, scrubbed with a soft bristle brush until clean and then rinsed meticulously to get all of the soap out. There is no substitute. The human touch allows for special attention to potential problem areas of the rug. Although this appears to be a simple process, the art of washing Oriental rugs lies in knowing how to deal with different types of stains, fabrics, dyes and emergencies that arise when, for example, colors unexpectedly break and run. Proper hand washing will maintain the primary oils and lanolin that protect the rug and provide it with beauty and luster. Never steam clean or dry clean your Oriental rugs. These cleaning methods actually trap dirt in the rug instead of removing it. The rug is stripped of its natural oils, and harmful residue sticks to the rug. In some cases, the rug will suffer irreversible damage. Simply stated, it is not proper to use anything on an Oriental rug that you would not use on your own hair. Regular vacuuming can help remove harmful grit and prolong the life of a rug. When vacuuming an Oriental rug, we recommend minimizing your use of a rotary type vacuum cleaner which beats the rug while it vacuums. This can increase the wear on the rug. Using the suction attachment is a better alternative. Once or twice a year, it is a good idea to flip the rug over and vacuum its back using a rotary vacuum. This will help knock out grit that has fallen into the rug's foundation. Depending on the amount of use, you should rotate your rug every six months to a year. This will help ensure even wear of the rug's pile. When a spill occurs, it is best to act immediately. The longer you wait, the harder it will be to remove. The first step is to quickly blot up or scrape up as much of the mess as possible. Always work from the outer edge of the spill towards the center taking care not to rub it deeper into the pile. After the spill has been contained, we encourage you to give us a call at The Magic Carpet for further advice.